(Updated) Gov. Palin: God bless the Greatest Generation. We are the sons and daughters of these heroes. 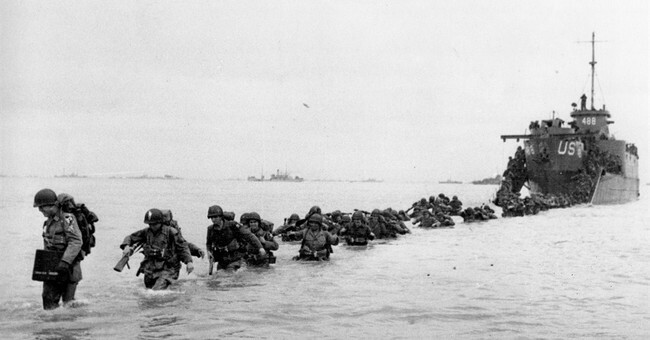 Today, on the 70th Anniversary of D-Day, fewer of these brave Americans are still with us. We call them the Greatest Generation because we remain in awe of the sacrifices they willingly and selflessly made to liberate the world from evil. Their efforts in war and later in peacetime made America the strongest and most prosperous nation in the history of mankind. What we have today we owe to them because they carried the fate of civilization on their shoulders. If our men had been defeated, what corner of the world would have been safe from the unspeakable horror of Nazism? It’s the honor of a lifetime to meet World War II veterans. I do stand in awe of them and will never forget those blessed meetings because these humble men embody true courage and valor. They served with real honor and distinction. That is why it is justified outrage felt by Americans today, knowing our government is so wrong to withhold anything our finest in uniform earned and so richly deserve, including their promised health care. Also included is the respect they deserve. They should be at the front of the line. This is our heritage; be proud of it! Parents, please take time to teach your children true history and the story of what these men accomplished on D-Day. Perhaps simple things like watching “The Longest Day” or “Saving Private Ryan,” and as a family making preparations to understand and celebrate our upcoming Independence Day, can remind our kids of sacrifices made for their freedom. Teach them to never take freedom for granted. Heaven forbid ever allowing our vet’s sacrifices to be in vain. God bless the Greatest Generation. A grateful nation owes you everything. This year marks the 70th anniversary of D-Day, the Allied invasion of Normandy, France, and the long-awaited opening of a western front. The year before, Soviet leader Joseph Stalin had repeatedly asked British Prime Minister Winston Churchill and American President Franklin Delano Roosevelt to open a second front on the Atlantic Coast of Europe, to provide his army on the east with relief. General Dwight D. Eisenhower, the supreme allied commander in Europe, planned and carried out the liberation of Western Europe and invasion of Germany, code-named Operation Overlord. This large-scale invasion required hundreds of thousands of troops to be assembled and trained for amphibious landing. The plans had to account for beach attacks and required information on the terrain and weather tracking. The invasion began on June 6, 1944. It included nearly 3 million soldiers, sailors, airmen and marines, some 11,000 planes and nearly 7,000 vessels carrying close to 200,000 tanks and other vehicles. Imagine 100 million Americans reciting the words of this prayer with their president. “Almighty God: Our sons, pride of our Nation, this day have set upon a mighty endeavor, a struggle to preserve our Republic, our religion and our civilization, and to set free a suffering humanity. “For these men are lately drawn from the ways of peace. They fight not for the lust of conquest. They fight to end conquest. They fight to liberate. They fight to let justice arise, and tolerance and good will among all Thy people. They yearn but for the end of battle, for their return to the haven of home. “And for us at home — fathers, mothers, children, wives, sisters and brothers of brave men overseas — whose thoughts and prayers are ever with them — help us, Almighty God, to rededicate ourselves in renewed faith in Thee in this hour of great sacrifice. And Jack Carpenter wrote: “I am an eighty one year old veteran and they won’t even allow me on a ladder. This guy shows that once a hero, always a Hero.” Thank you for your service, Mr. Carpenter! God bless these wonderful and inspiring vets! Yeah, President Reagan was very eager to celebrate the “old fellows” who had been “young boys” forty years before, who had taken those cliffs, who were members of the U. S. Army Rangers. President Reagan wanted very much to sort of get his hands around and to lift up a generation that until that point had not been completely, specifically celebrated as this wonderful generation that fought and won World War II – 16 million of them, you know, served in the U. S. Armed Forces during World War II – and who also got through the Depression before that. So that was some of the vibration that was behind this speech. Absolutely. 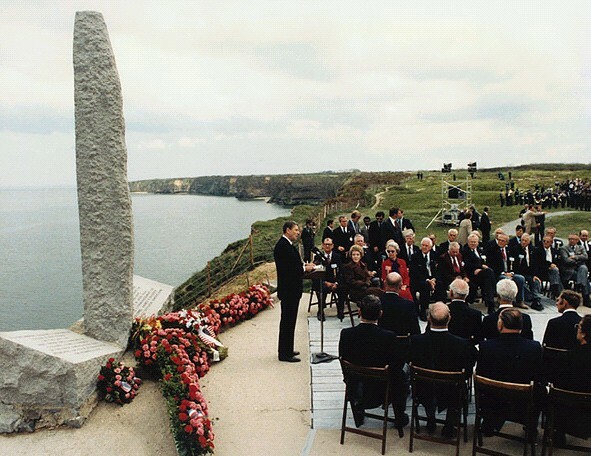 That speech, the Point du Hoc speech, took place in 1984. Ten years before, in 1974, the Vietnam War had ended , and the members of the U. S. military were not being treated with so much respect and hadn’t really gotten their due from the United States for almost a generation. Reagan was determined to turn that around. He had great respect for those who had fought in Vietnam. He felt they had not been fully appreciated. He was governor when the prisoners of war, the Hanoi Hilton fellows, the U. S. prisoners of war from Saigon and elsewhere were finally freed. It was Reagan who came It was Reagan who came and welcomed them and had them over to the Governor’s mansion. He was keen on getting greater appreciation for the U. S. military from the American people. And he succeeded. The text of the speech – the ostensible thing that was being said – was, “Look, civilized nations of the West, look what you did 40 years ago when you held together, joined together, you defeated a terrible tyranny called Hitler’s Germany.” So that’s what the speech is. Underneath that, Reagan was really saying to all the gathered leaders of the West who were there that day, “Guys, look what your parents and grandparents did. If we hold together as they did, we are going to defeat together the tyranny of our time – and that is Soviet Communism. So by lauding the Word War II generation, Reagan was also trying to inspire those who now still had to hold together. Ronald Reagan was funny. You would think having been in show business, having been in Hollywood for a long time, that he would talk that way – “I nailed it. I owned that room.” Stuff like that. [Kelly comment] No, he never did, or not that I ever saw. Reagan was amazingly modest. He had a lot of humility. And he didn’t brag about his ability to get people When people listened to him and they felt as he did, he felt like that was because he felt like they did. [Kelly comment] He felt like there was a kind of communion going on. But he didn’t brag. He was a fellow who had an ego who didn’t brag. Here is a transcript of that famous speech, spoken by a President with great respect for our military and who walked the walk to give the military all the support they needed to protect our nation with strength. We are here to mark that day in history when the Allied armies joined in battle to reclaim this continent to liberty. For 4 long years, much of Europe had been under a terrible shadow. Free nations had fallen, Jews cried out in the camps, millions cried out for liberation. Europe was enslaved, and the world prayed for its rescue. Here in Normandy the rescue began. Here the Allies stood and fought against tyranny in a giant undertaking unparalleled in human history.